It's the state made famous for its cornfields (one carved into a baseball diamond in the movie "Field of Dreams"), its role kickstarting the presidential race with its caucuses, and the picturesque bridges of Madison County. It's Iowa, and it's where sliced bread and the Eskimo Pie were invented. It's also where famous Americans John Wayne, Glenn Miller, Ashton Kutcher, Johnny Carson and Herbert Hoover were born. Even the fictional "Captain James Kirk" of "Star Trek" will be born there in the future (there's a plaque in the town of Riverside commemorating the upcoming event). The spirit of adventure that encouraged Captain Kirk to go where no man has gone before can be found throughout the Hawkeye State; interested in exploring? Here are 20 cool things to check out. Dutch refugees founded this charming town back in 1847, and their heritage is all around. 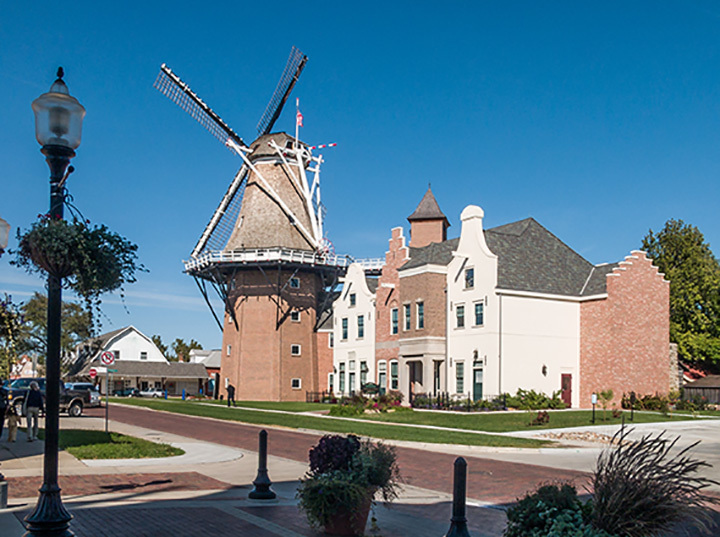 It's home to the tallest working windmill in America, as well as the Tulip Time festival that takes place every May. It's often been favorably compared to much bigger gardens in the country, with 60 "pocket-sized" displays, featuring everything from hostas to roses. The koi pond is charming, and the many mature trees are gorgeous. Best of all? It's free. The center commemorates a period in 1804 when the Corps of Discovery regrouped in Sioux City (and lost a key member of their team). There's a wealth of information, conveyed through animatronic figures, interactive exhibits and much more fun stuff. Nothing like a sky full of colorful hot air balloons to put a smile on your face. From late July to early August, that's what goes down (or up) in Indianola. This decades-old event also features balloon rides, fireworks and more fun. Of the county's original 19 covered bridges, six of them remain - and have lost none of their charm. There's a festival in October that includes guided bus tours. Come see why they inspired a best-selling novel and hit movie. Dubuque is the oldest city in Iowa, and this fantastic facility celebrates its place on the mighty Mississippi. There are six huge aquariums featuring creatures native to that part of the river, along with touch tanks and plenty of exhibits that trace the waterway's history. German colonists settled the region in the mid-19th century, and the area features many buildings preserved from that era, including the original general store and blacksmith shop. Nearby, indulge in traditional German foods and crafts as created by descendants of the original settlers. Beginning in the 1880s, three of Cedar Rapids most prominent families lived on this opulent 26-acre estate. One of the quirkier features is the pet cemetery where several beloved German Sheperds belonging to those families are buried - along with a few lions. You may have heard of "ice climbing" - but its never been done in quite this way. When its cold enough, a silo near the University of Northern Iowa in Cedar Falls is hosed down and transformed into a thick wall of ice. Have at it. The good thing about snowshoeing is, it's not hard to learn. And it's a great way to get outside and enjoy the brisk Iowa winter. There are plenty of places around the state to try your hand; here's one area.